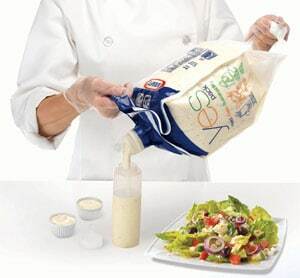 Kraft’s food service salad-dressing pouch says YES! Kraft’s pouch, designed for food service applications, is a replacement for one-gal (3,75-litres) rigid plastic jugs typically used for salad dressings. Made from a high-strength, multilayer, nylon/polyethylene film, the pouch is perfect for the rigours of a busy food-prep area. This package goes all the way back to 2007, when Kraft challenged its suppliers to come up with an improvement on the rigid plastic container and threaded closure that has been the mainstay in this product category for so many years. Launched commercially in January of 2012, the acronym “YES” is shorthand for the pouch’s Yield, Ease-of-use and Sustainability features: squeezable, it permits a 99% yield of dressing; dual easy-grip handles and a spout make it easy to carry and enable precision pouring; and it requires 50% less energy during manufacture compared to a rigid jug, take up 50% less landfill space, and transport generates 70% fewer CO2 emissions.